Through the Fiberhouse Residency individuals engage with the threads that connect us in an immersive week-long stay in our Brooklyn based live/work studio. All artists, designers, poets, technologists, researchers, healers, and craftspeople interested in integrating cloth that heals into their practice are encouraged to apply. You do not need to have a background in textiles (but if you do, that’s great too). Residents will have access to about 400 sq ft of studio space and a place to stay in Red Hook, Brooklyn – free of charge – from a Monday-Saturday. They will also receive 2 private sessions to support their project. Residents will share the space with at least one Fiberhouse facilitator and our house cat, Sid Vicious. Residents must purchase their own food (they will have access to our shared kitchen and fridge). Residents have access to tapestry looms, dye pots, felting mats, a sewing machine, table space and other fiber art related tools. Residents must purchase all the materials they need to fabricate their project. The Fiberhouse facilitator(s) will provide ample support in sourcing materials. 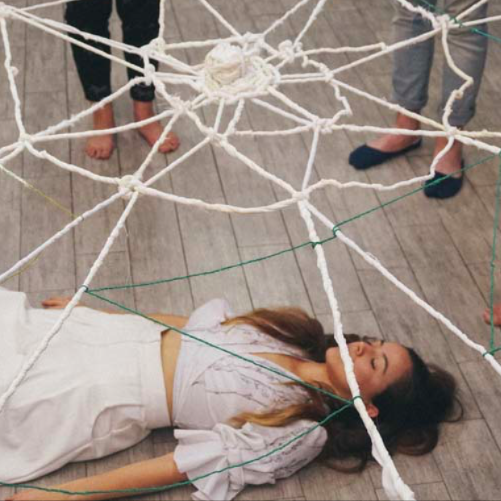 The week-long stay culminates in a small group workshop to be hosted at the Fiberhouse. Workshop topics should relate to each residents’ personal practice and proposed project. Any workshop fees collected will be used to cover the costs of the residents’ stay. To apply, please fill out the form below. Select applicants will be contacted for a Skype interview. Potential session topics include weaving, felting, garment construction, block printing, flower dyeing, dyeing with food waste, indigo dyeing, and creating inks and paints from natural pigments. Thank you! We will get in touch with select applicants to schedule a skype interview. Happy sheep, alpacas, goats, and bunnies produce happy fiber. Creating a system based on empathy and reciprocity, we support local farmers and the soil, plants, and animals providing the resources. We hand forage, give a second life, or carefully source when gathering plants for pigment or fiber for textile development.